I am a Christian. I am the salt of the earth. My little faith allows me to move mountains, and the Bible seems to tell me that mountains are representative of governments. I gather this from Daniel Chapter 2, and the final destruction of the image outlining Gentile power, where Jesus Christ is pictured as a Rock that, in his millennial day yet future, smashes the image, and the Rock then becomes a mountain to fill the hole earth. Maranatha. “Net Neutrality” is what we have right now with respect to Internet service, excluding the fact that Monopolist Comcast shook down Netflix not long ago for special fees. I pay (way to much) for Internet pipes, as do content providers. What goes on between my pipe and their pipe is not the provider’s business, the charge is for the pipe. I’m more conservative than Ted Cruz I guess, and he is showing that he is a Republican in this matter, and not a “People’s representative.” Jesus Christ is always for the people, so I judge that Ted Cruz, openly my brother in Christ, is on the wrong side in this matter. We are already paying for pipes on the Internet. Because Cruz claims “Net Neutrality” is about the government coming in to regulate, he strikes a responsive chord in me, and other believers as well. And of course, there IS a danger on this side of the issue. What he is talking about is ALSO a real threat, and I will get to it. But let me deal with the clear and present danger first. In economics, we learn a basic principle that, CETERIS PARIBUS (all things being equal, which we do find in this analog universe to be universally never quite true), pricing is formed at the intersection of supply and demand. This CETERIS PARIBUS condition includes the facts that suppliers can readily enter a marketplace, among other things. In the case of Internet service providers, there are public resources allocated by government to them, and therefore there is NOT ready entry for competitors to enter the marketplace. Therefore, because of this violation of CETERIS PARIBUS, we know a priori that a form of monopoly – with a few players instead of only one – called “oligopoly” will results, just as it has. In the world of Internet service providers, a few major players now dominate the marketplace, and the entry of new competitors is not permitted due government entities allocating public resources to them: airwaves, government-sponsored land access (easement ways), etc. In economics, therefore, we have a supply-side issue. 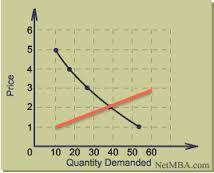 “Demand curves” are made up of the theoretically infinite points of individuals’ willingness to pay a price for a good or service. SOME ARE WILLING TO PAY MORE THAN OTHERS. This is why some people will pay $35 for a cheeseburger at the 49’ers new Levi’s Stadium, while I will buy two-for-$3.50 double cheeseburgers at Hardees. Let’s take a “free (fair) market,” as an example, and see how it is supposed to work. Our subject is cheeseburgers, so you see from the above graph that 55 people are wiling to pay $1 for a cheeseburger, while only 10 are willing to pay $5 for one. 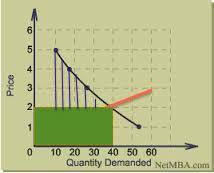 Now, we will add a supply curve top the drawing. Our suppliers of cheeseburgers are willing to supply only 10 cheeseburgers at $1, but are willing to supply 40 cheeseburgers for $2, and 60 cheeseburgers for $3. Where supply and demand meet is called the “equilibrium price,” or “market price,” which in a fair market is a fair price. $2 per cheeseburger. Anyone not willing to pay $2 isn’t going to get a cheeseburger. Everyone willing to pay MORE than $2 is going to get a break in price over what they are actually willing to pay. That “break,” is called the “consumer surplus,” and is a benefit to society. And why can’t the supplier “make” the 10 guys willing to pay $5 per cheeseburger pay what they are willing to pay? Because SOMEONE ELSE is willing to offer them that cheeseburger for $2. 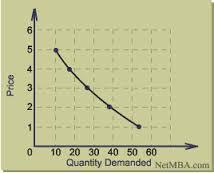 Now, when the marketplace becomes such that the “someone else” can’t enter the market to supply, the monopolist – or pack of oligopolists – begin to look at this demand curve in their own especially jaundiced way. They say, in the case of oligopolists, “Let’s find a way to get that $5 from those ten guys, and $4 from those next 5 guys, and $3 from the next 10 guys, and so forth. Instead of having to maximize profit in competitive world, they seek to maximize REVENUE in a non-competitive world, and they trace this demand curve the best they can, and gobble up the consumer surplus for themselves. In the context of the Internet, this is EXACTLY what the oligopolists want to do. having already sold bandwidth uploading and downloading quantities to Internet users, they now want to discover those who are paying less than they are willing to pay – those individuals “benefitting” from the consumer surplus – and, using market differentiation tactics, grabbing these revenues to themselves. The competition that would not let them do this is not present, because entry into this market is not open due to the government licensing involved. So, someone other than a competitor needs to bring the stick a competitor otherwise would. It is pretty well established that government has an economic role, in a capitalist society, to keep competition fair when it creates or discovers a monopoly. Teddy Roosevelt, who “spoke softly and carried a big stick,” used that stick to bust trusts. In short, it is the role of government to assure the consumer surplus to the public. From a public policy point of view, “Net Neutrality,” – to an extent, “what we have now” – is a slogan by those who anticipate that oligopolists have their eyes on the consumer surplus, and will try – as oligopolists always do – to eat the surplus due to the public. Net neutrality is a right thought. Historically in our country, we have adhered to the slogan of “the government which governs least, governs best.” Obviously it has to be the government that insures that oligopolists in the Internet service market place do not use consumer differentiation tactics to grab the surplus. However, there is also that tendency of government to usurp power reserved to the people as it conducts even its rightful business. It occurs to me this is exactly what brother Cruz is talking about. I will give him the benefit of the doubt, as long as doubt exists, that he fears the solution to monopoly power might be as bad or worse than the monopoly power. And it could very well be is government does its job poorly, and, for instance, attempts to grab the surplus for itself, or for the “right people” who support a present regime. The fact is, however, that in the case of public utilities, government has, at least in the past, functioned well in its regulation, and even provision of services. I live in a public power state: Nebraska. State corporations generate the power here, supply water, and distribute natural gas. Historically, these three commodities have been provisioned by our state more cheaply than private industry has supplied them elsewhere, where they function as government licensed and regulated monopolies. In the legacy of George Norris, Nebraska has done a reasonably good job of maintaining the consumer surplus in these markets for the consumers. So it CAN be done. I can well understand Senator Cruz’s concern and skepticism about the Federal Government handling this task well. But he is wrong on this issue, and I hope this means he is mistaken, and that it’s not just his Republican roots showing through.